For years we have been “loving to death” a marvelous life form. The good news is that we are learning the errors of our ways in time to make a difference. Coral reefs are constructed by clusters of simple marine animals called cnidaria. Like their jelly fish and anemone cousins, the cnidaria species known as coral have mouths surrounded by small tentacles used to catch and eat tiny prey the size of planktons. To compensate for their lack of bones, cnidaria live in organized colonies and secrete calcium to build a protective exoskeleton known as coral reefs. Like many creatures, coral requires sunlight found in clear, relatively shallow waters. 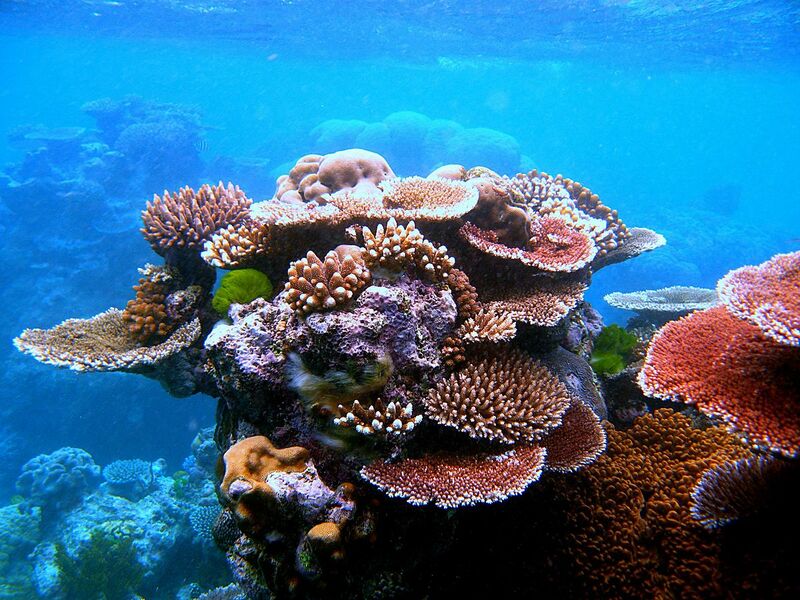 Corals’ shallow water habitats are shared by many other creatures that have grown to depend upon the nutrients and small prey attracted to reefs. Reef fish have evolved and adapted to this unique environment in part through colorful camouflage hiding them from even larger prey. In the tropics, clear shallow waters and colorful coral and reef fish are attracting increasing numbers of terrestrial animals, aka us. Marveling at their otherworldly beauty, we swim and snorkel among the coral colonies and fish. Few realize, though, that our very acts of appreciation threaten the marine communities’ survival. It should be obvious that we shouldn’t stand or sit on coral reefs. And, we must be mindful that the fins we wear when snorkeling can slice off or knock down delicate coral structures. Sadly, though, we are unknowingly killing the defenseless cnidaria themselves through chemical attacks. Who among us has not seen an oily slick floating on the surface of otherwise pristine water? At least four chemicals commonly used in sunscreens can kill coral, according to numerous environmental and public interest authorities. The Environmental Working Group, for instance, has issued warnings about oxybenzone (used in about 70 percent of non-mineral sunscreen products), butylparaben, octinoxate and a chemical called 4MBC. Though all of these and others are harmful, oxybenzone, widely used in plastics and nail polish, may be the most harmful substance in sun lotions says EWG and other groups. Although the oceans are big, 4,000 to 6,000 tons of sunscreen enter coral reef areas each year, the National Park Service tells us. And, tiny portions of sunscreen chemicals – the equivalent of a drop of water in an Olympic pool — can be toxic to corals, according to a study cited by Time magazine. Lest you think this is academic because it won’t affect where you swim, think again. Sunscreen chemicals are affecting reefs and associated marine life in Virginia, the Carolinas and the Virgin Islands. Indeed, the Environmental Working Group reports that recent studies have found dangerous levels of oxybenzone in reefs in the V.I. (4,000 times known harmful levels!) and off South Carolina (four times the amount known to be harmful). Volunteers who comprise the non-profit Island Green Living Association (iglavi.org) are working with governmental and other entities to save U.S. Virgin Island coral reefs that, like all coral worldwide, are being stressed by rising sea temperatures, related climactic changes and real estate development. “Reducing waste streams in our island communities, eliminating harmful run-off into the sea, adopting more sustainable living practices and reducing use of harmful sunscreens can all help save our stressed coral reefs,” says Harith Wickrema, chairman of the Virgin Islands Waste Management Association and president of the Island Green Living Association. Mr. Wickrema, a Temple University professor and eco-tourism expert, is optimistic that we can save our reefs for future generations of islanders and tourists. He and others say many sunscreen products utilizing zinc oxide or titanium dioxide will effectively block the sun while not leaching harmful chemicals into the water. Some sunscreen specifically marketed and identified as “reef safe” actually contains oxybenzone, Mr. Wickrema said. Consumers need to look carefully at packaging or, better still, visit the Environmental Working Group site for more information on safe products. Visitors to St. John can find a list of stores selling safe sun products by clicking on the “Saving our Reefs” button at iglavi.org. Dr. Craig Downs, a Virginia based environmental scientist cited by Island Green Living, notes that Caribbean reefs have suffered substantial damage and destruction over the years. “Any small effort to reduce oxybenzone pollution could mean that a coral reef survives a long hot summer or that a degraded area recovers,” Dr. Downs has said. The National Park Service and National Oceanic and Atmospheric Administration (NOAA) are among the Federal government agencies studying the health of our reefs and educating the public on how to save them. NOAA, in partnership with commercial SCUBA divers who donated their time and knowledge, the University of the Virgin Islands and U.S. Virgin Islands government, recently completed a two-year effort to map and assess the health of the Territory’s coral reefs. The funds will go to the V.I. Department of Planning and Natural Resources to support “highly successful and in-demand educational programs including EcoCamp, a citizen science water quality project startup, and funds to support a Reef Benefits educational campaign” among other projects, Rep. Plaskett said. Despite an unsettling national political scene, it is heartening to see individual citizens, some Federal agencies and local governments (Hawaii, California and the USVI come to mind) taking action in our home waters to save coral reefs, one of Earth’s most endangered life forms.